IT’S A WELL-KNOWN FACT THAT EARLY CHILDHOOD DEVELOPMENT IS CRUCIAL, as it lends itself to the advancement of a young child’s emotional, social and physical growth—especially in their first five years. Yet, where does a parent start when it comes time to enroll their child? Luckily, area schools are evolving their early childhood development pri or to pre-K as a means of investing in the younger generation. 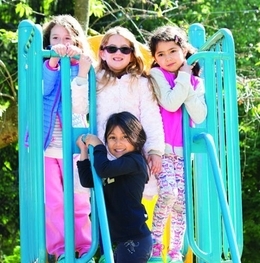 Haddonfield Friends School (HFS), for one, offers the option of three programs suited for ages 2 through 4, known as Swallowtails, Skippers and Monarchs respectively, within their Early Childhood Center (ECC) . Each level is designed to meet the educational and developmental needs of the young child, while also nurturing skills—including social , communication, gross and fine motor skills—within a whole school setting. As children move up into the full-day kindergarten program, students are introduced to math and hands-on science as they learn the life cycle of a monarch butterfly and enjoy the responsibility of raising a Canine Companion for Independence serv ice dog. “We start the year with the butterfly unit, where they are using microscopes, they’re in the butterfly garden, looking for the l ittle eggs, watching them hatch,” notes Sharp. The school is heavily involved with the Coriell Science Fair, which features students, grades 6 through 12, from Burlington, Gloucester and Camden counties showcasing their science projects ranging from biochemistry, botany, computer science, medicine and health, physics and more. Each year, some students move on to the Delaware Valley Science Fair based on their awards at Coriell. While the curriculum as a whole is enough to entice, parents themselves praise HFS’s early childhood programs. Eric Mills and Kristin Carberry’s two sons , who are students in fifth and third grade, have both attended HFS since the early childhood program and the decision is one they’re proud of.